In September, the Netherlands counterterrorism unit the NCTV identified a new group threatening public safety: anti-wind farm activists. These activists, the NCTV claimed, had “radicalized” to the point that they represented a public risk. The picture the NCTV painted—of a group that has threatened, intimidated, and destroyed the property of politicians and developers—might sound bizarre to the casual follower of the renewable energy industry. But anti-wind farm activism is serious business, and it isn’t limited to the Netherlands. At the December 2017 inauguration of France’s first offshore wind turbine, protesters set fire to tires in front of police in riot gear. Earlier this year, French protesters went even further, setting fire to wind turbines directly and lodging explosives in others. Across Europe, where last year countries erected about 5,000 wind turbines, the sudden emergence of the towering machines—both on land and offshore— has incited deep-seated anxiety in a small but vocal minority. Anti-wind activists are a diverse patchwork, from local residents stirred by NIMBY-ism to fishermen claiming wind farms displace fish populations to coal workers dreading a renewable energy future. In the Netherlands, which is home to one of the largest offshore wind farms in the world (150 turbines in total) and which is planning another, even larger offshore wind farm that it will anchor to an artificial island, anti-wind farm activism reached a fever pitch this year. In April, activists distributed pamphlets calling pro-wind farm politicians Nazis and planted flags with swastikas that compare the encroachment of wind turbines to living in “occupied territory.” Farmers who have supported the construction of land-based wind turbines have discovered heavy chains, concrete-filled cans, and iron bars on their property, seemingly left by activists who want to damage their farm equipment. 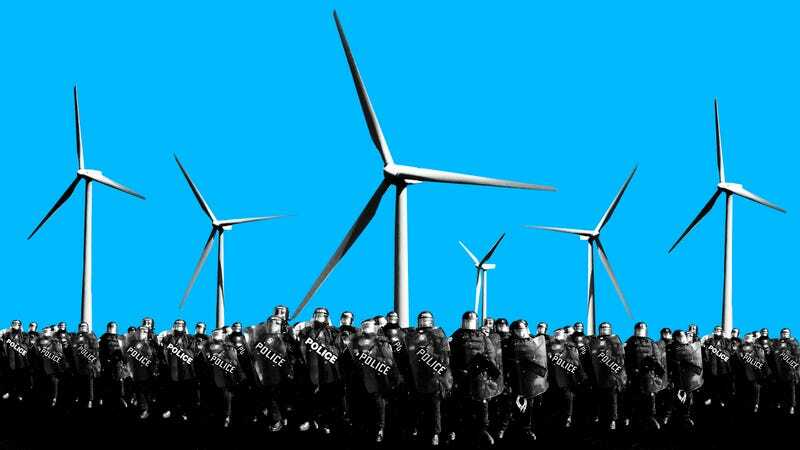 This July, anti-wind farm activists in the northern regions of Drenthe and Groningen in the Netherlands issued a threatening letter to 34 companies involved in the construction of wind farms. Jan Nieboer, a leader of the anti-wind farm group Platform Storm, told the Dutch news service NOS that he has heard of people buying hand grenades and other explosives for protests. The complaints of these activists are multitudinous. Many resent the way wind farms are located without their input. Others despise the presence of turbines along their skyline. Some fear that living near wind turbines will cut into their home values (although at least in the United States, research has shown no effect). Another sore spot is that the money made from wind farms is rarely shared with the local community. “Communities are almost always more supportive of wind projects when the financial benefits are distributed widely among locals residents, rather than flowing to outside investors,” Bob Darrow, a PhD candidate at UMass Amherst who studies the politics of renewable energy, told Earther. But, at least for onshore wind farms, the most galvanizing fears revolve around rumors that wind turbines punish the health of local residents. Activists claim that the low noise emitted by turbines triggers everything from persistent headaches to behavioral changes in animals in what they term “wind turbine syndrome,” a concept that scientists have largely rejected. A 2013 analysis from researchers at the University of Adelaide in Australia concluded that although noise from wind turbines can result in “annoyance” and potentially “poorer sleep quality” among residents, “there is no consistent evidence” tying that noise to many of the self-reported health effects. In a 2014 paper, King’s College psychology professors attributed “wind turbine syndrome” to the “nocebo effect”—a psychological phenomenon in which the expectation of negative health outcomes becomes self-fulfilling—and to anxiety about technological encroachment. One prominent vessel for those false claims is U.S. President Donald Trump. During an August 2018 rally in Indiana, he insisted that people living near wind farms “go crazy after a couple of years,” before adding that wind turbines “kill so many birds” and that resisters “can blow up the windmills” if they need to. Whether Trump’s rhetoric has stoked more wind energy resistance on the American right is unclear. But even land-based wind, which is a booming industry across parts of the midwestern U.S. and Great Plains, struggles against backlash from rural communities that pushed over 120 local governments to scrap or restrict turbines from 2015 to 2017. Offshore wind, meanwhile, has long struggled to gain a toehold thanks to fierce local opposition. In Cape Cod, a 2001 attempt to launch what would have been the U.S.’s first offshore wind farm was abandoned in December 2017 after a decade of lawsuits from local residents concerned about disrupting fishing patterns and coastal views. Rhode Island’s 6-turbine Block Island Wind Farm, which opened in December 2016 after angry locals likened it to “visual pollution,” now holds the title of the first U.S. offshore wind farm. Recently, U.S. states like Massachusetts, Rhode Island, New Jersey, and New York have unveiled ambitious plans to build offshore wind farms that will power hundreds of thousands of homes within the next decade. But UMass professor Erin Baker, who has written about the rise of offshore wind farms, doubts that these projects will see opposition on the scale of Europe because most U.S. offshore wind farms will be located 25 miles or more from the coast. That distance “will not get the general public too interested,” Baker told Earther. Fears about “wind turbine syndrome” tend to dissipate when a wind farm is far offshore, and 25 miles is roughly the distance where wind farms become invisible from the shore, pre-empting complaints of visual pollution. What’s more, only a small subset of the U.S. population actually opposes wind farm development. Just a quarter of residents living within half a mile of a wind farm have a “ negative” or “very negative” view of wind farms, while three-quarters take a neutral or positive view, according to a poll of Americans from researchers at the California-based Berkeley Lab. And most Americans, including roughly 8 in 10 Republicans, support expanding wind and solar energy, according to a May 2018 Pew poll. In Europe too, the number of people who oppose wind farms is quite small. In the Dutch region of Groningen, where wind farm opposition is at its strongest, only 2 percent of people have reported experiencing “a form of hinder in their everyday life by windmills,” according to statistics that University of Groningen researcher Tom Postmes shared with Earther. In Denmark, where wind turbines accounted for an unprecedented 43.4 percent of the nation’s electricity last year, at least 8 in 10 people support their construction. Still, the anti-wind minority remains an exceptionally vocal one. Especially for onshore wind farms, resistance in Denmark has grown so intense that it has become nearly impossible for some local governments to approve turbines, according to Darrow. “In many municipalities, officials are hesitant to support wind projects for fear of the public backlash such proposals inevitably generate,” he said. One strategy to quell that backlash is for wind energy proponents to work more closely with nearby communities about where to site wind farms so that they will be the least disruptive. Denmark has seen some success engaging with fishermen to build offshore wind farms away from prime fishing territory, for instance. But if there’s one thing proponents of wind energy have learned in Europe, Darrow said, it’s “not to get overconfident about the public supporting their projects.” And while U.S. opposition hasn’t reached the kind of fever pitch that it has across the Atlantic, it seems unlikely that the renewable energy source will continue to spread without a few fights.